Back when my family lived in our starter house, with an economy refrigerator that did not have an icemaker, my husband bought a pair of Frosty Mugs. Then we always had something cold in the freezer for drinking soda pop, even if we ran out of ice cubes from the trays. 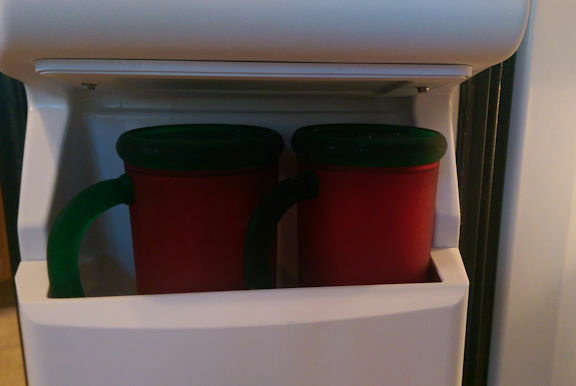 Although the refrigerator in our current house has an ice dispenser in the freezer door, we still used the Frosty Mugs for a few years after moving. Then I gave up sugary drinks to stay healthy, while my husband switched to Coke Zero and bought a set of old-fashioned Coke glasses to put it in. The Frosty Mugs sat in the freezer door for years afterward, totally forgotten. I just happened to notice them a few days ago and think, “Hmmm, has it been five years since we last used these things, or closer to ten?” Whichever it is, they’re definitely clutter!